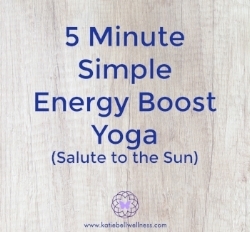 A simple 5 minute yoga practice that will boost your energy. Saluting the sun in the practice allows you to pull the energy from the sun. This will open you heart, calm your mind and awaken the body. Great for a morning or afternoon boost. All levels welcome, beginner or advanced yogi. This is an awesome way to get energy flowing.